Many people hear him on the 947 Breakfast Club every morning and on your television sets when you're watching eNCA, but not everyone would know his story. 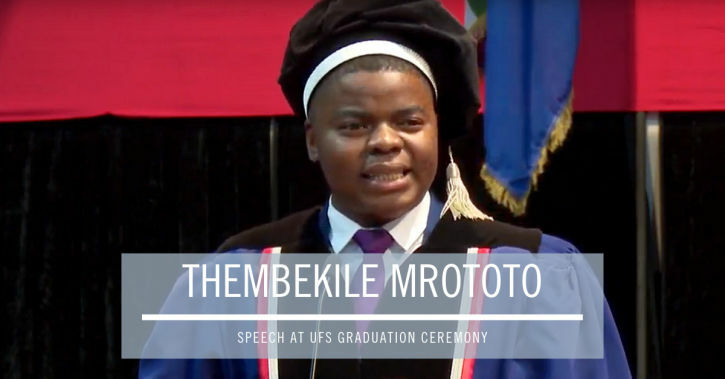 In 2012, Thembekile was financially excluded from the University of the Free State; seven years later he was asked to stand in front of the graduates and tell them about life. Thembekile returned to the institution he once frequented to share a heartfelt timeline of what he had to do to get to where he is now. You'll hear his quirky comments on-air every morning but you've never heard him like this before. In his speech, Thembekile reflects on the sacrifices his mom made, the sacrifices he made and his relentless pursuit to achieve his goals. When I applied at UFS, I had no idea if I'd get accepted, and when I did get accepted I didn't know how I would pay for my studies. I took a leap of faith and sent an email to EWN asking for an internship. I received a response and was offered a spot as overnight news reader. I went Johannesburg not knowing Sandton for this interview at EWN. A week later an email arrived and it read, Welcome to EWN when would like to start? Stay with like-minded people. Stay away from people that tell you how difficult it is but don't give you solutions. Never be afraid to affirm and be proud of yourself. I know we're taught to not praise ourselves, but there's nothing wrong with that; it's not arrogance. It only becomes arrogance when you put others down. There's nothing wrong with looking in the mirror and saying that I'm damn good at what I do. There's no greater feeling than the feeling of being supported by your parents. Even in hardships. I gave up so many weekends when I did night shifts at 702. No matter how small the opportunity is after this. Give it your all. If in the office they say get me a cup of coffee, be the fastest to get it. By being here today, I hope that I have encouraged you to go out there and be fearless when chasing your dreams - even if it means begging, harassing people via email. Keep doing it. It's all in you. This is one of the most inspiring speeches you will ever hear. As a South African, many of us will be able to relate to the many hardships that you're faced with in your pursuit of success. Thembekile, you are an incredible human being and we salute you, Sir. ‘A Donkey’s Life’ was created to help Keegan spread awareness of his cause and we hope folk will assist him along the way and look out for his safety. Jay-Z, Beyoncé, Pharrell, Cassper Nyovest and more on the Global Citizen lineup! Since the festival began in New York in 2012, Global Citizen has grown into one of the largest platforms for young people. Baby Hannah, now two-and-a-half-years, was born with a rare condition that left her face deformed. South African music group GoodLuck have teamed up with Bridges For Music and the Cape Town Cycle Tour to raise funds. Actress Connie Chiume's dream was for every child in South Africa to watch the movie Black Panther and 947 listeners made it happen. A rousing, heroic, original, South African #Western that will hit SA cinemas on 6 April 2018.